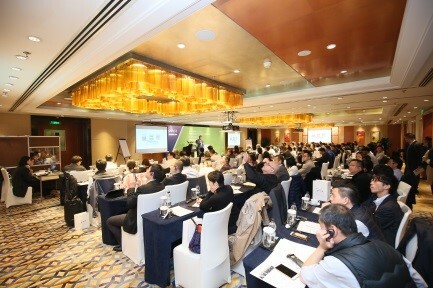 pinfa organised the first workshop on fire safety challenges in electro-mobility with 140 attendees in Shanghai, 22nd November 2018. With its ambitious targets for electric vehicles, China is leading globally in the sales of electric vehicles with almost 600 000 cars sold in 2017, three times the number of the next runner up, the USA. Electric vehicles pose new fire risks coming from the battery and high voltages and currents in charging and operating the cars. Safety standards for batteries, cables, connectors etc. are still under development and not globally harmonized. For polymer materials particular challenges include resistance to arcing (high current tracking index = CTI), colourability and colour stability, especially for the “signal orange” for high voltage parts, where a CTI of 600 V is becoming a regular requirement. To protect against risks from electrical faults, UL 94 V0 is required by most OEMs in China. pinfa is also planning similar workshops in Japan and in Europe in 2019 – stay tuned for details. On this occasion, also pinfa China was officially inaugurated – the founding members in China are JLS, Budenheim, Clariant, Huber, Nabatec and Presafer. More members are welcome to join us! The first chairman of pinfa China is EngHeng Khoo, Head of the Business Line Flame Retardants, Clariant, who gave a video welcome address at the e-mobility workshop.